After a few days off spending time with my awesome little family making some amazing memories (that's for another post) I was back at it today in the shop! Retaking photos, fixing listings in the shop and planning and getting ready for this Friday. Can you believe that July 1 is Friday!?!? I feel like this summer, really this year, is flying by! But again, that's another blog post! This Friday, July 1, will be the beginning of my first ever Christmas in July sale! I am so excited about this sale! It will last from the 1st to the 10th. This is the time to stock up on gifts, stock up on items for yourself, and to get awesome deals on fall and holiday clothes items. There will be some shirt designs that will only be listed during this sale and may not be relisted later in the year. This is the time to snag yours! Remember, a lot of my clothes are limited edition/one of a kind items. You must snag yours while you can, waiting around cannot guarantee you will get the item. I am super excited about this sale! Make sure you share with your friends and family. 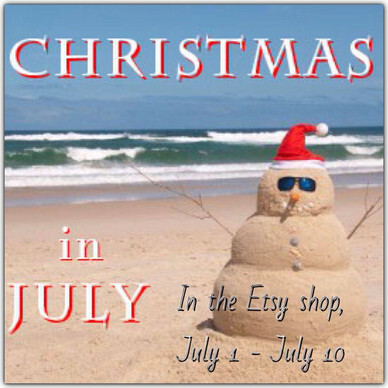 So some research, there are a large number of Etsy shops participating in the year's Christmas in July sales event! What are you excited about grabbing during this sale?!? !